Ten years ago Evgenii was in a car accident, after which he was completely paralysed in his lower body and has to use a wheelchair. The accident prompted Evgenii to rethink a lot in his life – simple things began to play a bigger role and his values changed. Evgenii is a fighter and didn’t give up – he did not become depressed and adapted himself to his new circumstances and takes care of himself. A close friend from his childhood who made Aliyah some years ago began to urge Evgenii to come to Israel. The doctors in Russia said they can’t help any more with anything although a couple of years ago nerve endings seemed to be working. 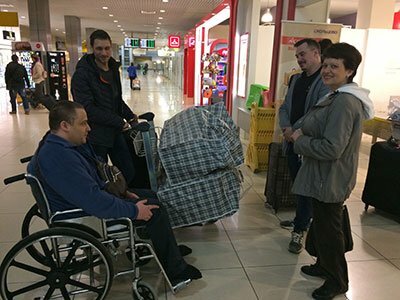 Evgenii has some hope of improvement in his condition in Israel. Evgenii is a programmer and can work from home. He hopes that he can continue to do the same in Israel as his location doesn’t really matter as his work is online. Although positive about the future in Israel he is finding it hard to leave the people close to him.